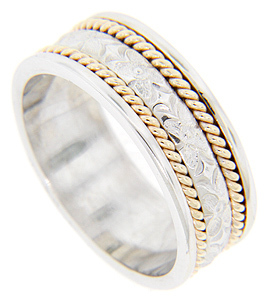 A subtle repousse floral pattern is flanked by yellow gold spirals on this 14K white gold modern men’s wedding band. Polished edges flank either side of the design. The wedding ring measures 8.1mm in width. The yellow gold version of this ring can be found on our website under number WBH8-834-PY. Size: 10. Cannot be re-sized but we can reorder in other sizes. The ring can also be purchased in 18K, yellow gold, platinum or palladium. Cost will depend on the current market value of the precious metal used.